Except as noted, all text, images, code and any other data associated with this Web site and any pages on it are copyright © by Jerry Hollombe and/or Terrea Lea. All rights reserved. E-mail addresses appear on this Web site as a convenience to our visitors. Copying them for any other purpose, including compilation for use in or sale as bulk mailing lists, is expressly prohibited. Thegarret.info does not send out commercial e-mail of any kind, solicited or unsolicited. If you think you have received such an e-mail from this domain, please notify the webmaster. He probably won't be able to do anything about it, but at least he'll know why he's suddenly getting so much hate mail. Spam and other messages posted to the Guest Book that are deemed inappropriate by the webmaster will be deleted without comment. The server this Web site resides on keeps logs of Web activity. The logs contain no information that can be used to identify a specific person. The Webmaster reviews log summaries to monitor how the site is accessed and used. Requests for pages that don't exist on this Web site are also logged. Only the requested URL, the requestor's IP address and a time stamp go into the log. This Web site neither sets nor reads cookies on your computer. We do not give or sell personal information, including e-mail addresses, to anyone. You may be contacted by the webmaster if you're an old friend or someone he thinks may have information to contribute to the web site or about old friends. If information about you appears on this Web site, including links to your e-mail address or home page, anyone viewing it can copy it for their own purposes. Apart from the legal prohibitions listed above, we have no control over that. 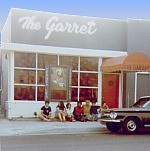 www.thegarret.info and thegarret.info are the only domain names associated with The Garret Coffee House and this Web site. We have no relationship with thegarret.com or any other similarly named Web sites. Every reasonable effort has been made to keep this web site and any pages directly linked from it "G" rated. However, we have no control over what other web sites contain or link to. Once you leave thegarret.info you are on your own and we can make no promises about what you may find there. The webmaster reserves the right to change any and all policies listed on this page without notice and at his sole discretion. Policy changes will be posted here in as timely a manner as feasible.